2016 already? It seems like the past year went up in smoke. Which it did for me quite literally. Books. TV shows. Barbecue University. And lots of travel. All perfumed by the intoxicating scent of wood smoke. January: In November 2014, the phrase “smoking is the new grilling” popped into my head. And with that, the concept for my new public television series, Steven Raichlen’s Project Smoke, came into being. For a nation obsessed with grilling—as we’ve been for the last decade—smoking is the next frontier. Project Smoke’s mission would be to bring smoking from America’s barbecue belt to everyman’s backyard. January was a whirlwind of preparing for the show: hiring staff, lining up smokers and grills, ordering ingredients (with a special emphasis on heritage and organic meats)—attending to the thousand details required to produce a TV show. As January came to a close, it looked might we might just pull it off. February: We converge at the scenic J. W. Marriott Starr Pass Resort in Tucson, Arizona—a crew of 25, including my longtime friends producer Matt Cohen and DP (Director of Photography) Richard Dallett; our culinary team (Chris Lynch formerly of Barbecue University at the Broadmoor); our wonderful food stylist Abby Derethik; our grill wranglers Andreas Langley and Rob Baas; and of course our own Nancy. If make take a village to raise a child, it takes an army to produce a TV show. We worked bone-crushing days of 14, 16, 18 hours for 2 weeks straight, but spirits always ran high. For me certainly, and for many of the crew, the Project Smoke taping was a high point of the year. Recipe highlights of the show: tea smoked duck, cold smoked Alaskan salmon, and a majestic spit-roasted then wood-grilled prime rib. March: Normally, March is one of the quieter months in my year, but this one I found myself on planes more than at home. 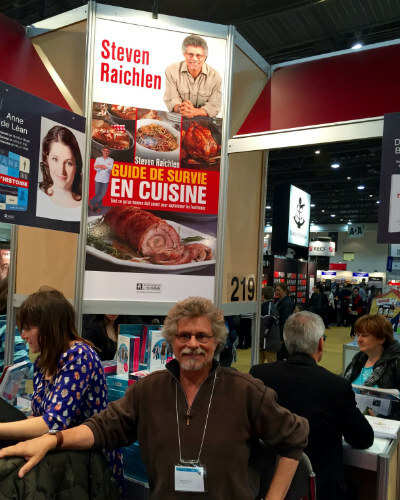 I traveled to Quebec City for the Salon de Livres (Quebec Book Fair)—here for the launch of Guide de survie en cuisine (the French edition of Man Made Meals). It snowed. 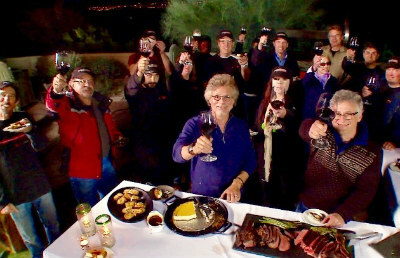 In Montreal, we shot the promos for my new French-Canadian TV show La Tag BBQ. (More on that below.) It snowed. Fortunately, I got to the French West Indies for a few days to continue my history of barbecue research (in particular a French West Indian dish called poulet boucane) and tropical barbecue in general. 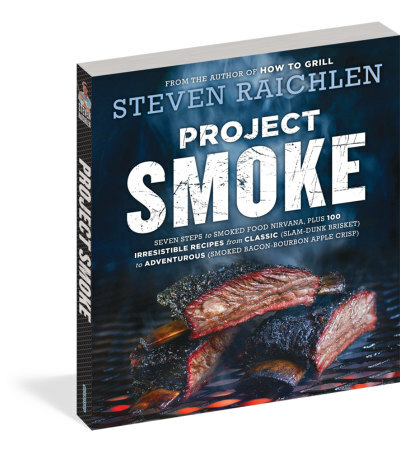 April: For the last 2 years, I’ve been working on the Project Smoke cookbook. (Most people write the book before they make the TV show, but I’ve never done things the conventional way.) On April 14, I turned in the manuscript—a 500-page crash course on smoking—hot smoking, cold smoking, smoke-roasting, rotisserie smoking—in stick-burners, pellet grills, upright barrel smokers, ceramic cookers, on charcoal and gas grills, and even with stovetop smokers and handheld smokers. To be sure, there are recipes—more than 100, ranging from the indispensible brisket and cherry-glazed baby back ribs to dishes you’d never dream you could smoke, like bloody Marys and flan. You can also read about my travels to Mexico, Scotland, Italy, and beyond to get the full story on smoking. May: Some of you know I have a degree in French literature, which finally paid off when I started taping TV shows in French in Quebec. 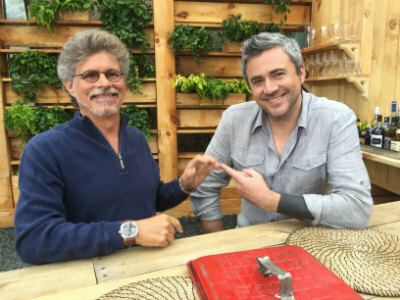 The first was a 4-season grilling show called Le Maitre du Grill (The Grill Master) for the French-Canadian food network, Zeste. In May, I taped a new show called La Tag BBQ. Each week my co-host, chef Martin Juneau and I welcomed a different chef from Montreal. The mission—to create grilled meals using surprise ingredients, surprise grills and smokers, and other challenges imposed to heighten the creativity. Martin and I joined in the grilling sometimes, which resulted in a new specialty at the Raichlen household: grilled sangria. 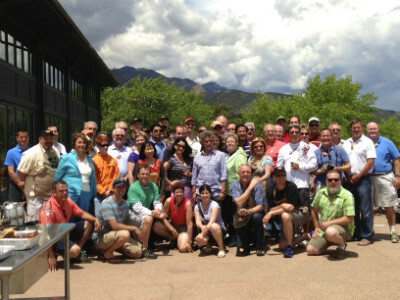 June: I look forward to June all year because it brings a trip to one of my favorite places on Planet Barbecue: the Broadmoor resort in Colorado Springs—home to Barbecue University. This year, we had grilling enthusiasts from all over the world, including from Colombia, Austria, even Hong Kong. Not surprisingly, the theme of this year’s course was “Project Smoke,” and we executed some of my favorite dishes from the book and the show: Big Bad Beef Ribs, Tulsa Torpedo, Bacon Bourbon Apple Crisp. Our grill and smoker collection grew, and I’m relieved to report that everyone passed the final exam. For info on the 2016 session, click here. 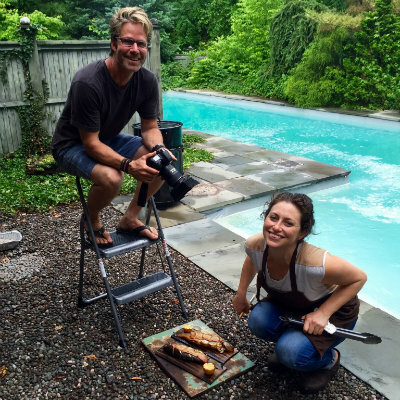 July: If a picture is worth a thousand words, the Project Smoke cookbook photo shoot, which finished up the first week of July, brought all the long hours of writing and recipe testing to life. We convened at the farm of award-winning photographer Matthew Benson (how nice to be able to run out to the garden for organic veggies), where stylist Nora Singley turned my food into gallery quality art. Visual standouts include the cedar planked trout, monster pork chops, and chocolate bread pudding, and I can assure you, no one went hungry. In case you’re wondering, it took 3 to 4 hours to prep, style, and shoot each photo. August: Destination Berkeley, California, for my annual planning meeting with The Companion Group. Our mission: to review our existing products and design new tools for my Best of Barbecue accessory line. Our best-sellers for 2015 included my newly redesigned Ultimate Grill Brush (now with shed-free bristles), rib rack, and grate lifter. Coming in 2016: brick size salt blocks for chicken under a brick. Plus ridged silicone food gloves to make pulling pork even easier. 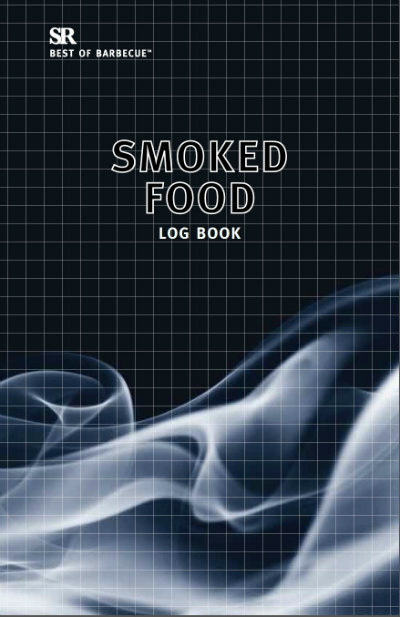 A Smoking Logbook to help you record the wood, seasonings, temperatures, and other essential details of each smoke session. Plus three way cool devices to help you smoke on a gas grill. September: Finally! Vacation time on Chappaquiddick Island, Martha’s Vineyard. (Yes, that Chappaquiddick—the setting for my novel, Island Apart.) 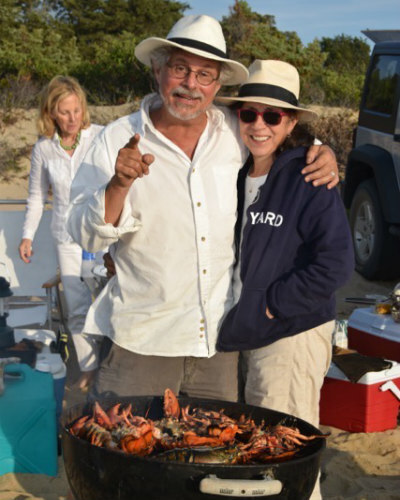 One of the high points of our summer is a beach barbecue with our friends Mitch and Stephanie Reitter (they run Camp Towanda—in case you have camp age kids). On the menu: grilled clams we dug in Katama Bay, grilled lobsters with basil butter, grilled corn, and smoked cheesecake for dessert. Call it a deconstructed reconstructed clambake and I promise to blog about it next summer. And of course, I did some smoking in our cedar smokehouse. October: Talk about thrill of the grill. 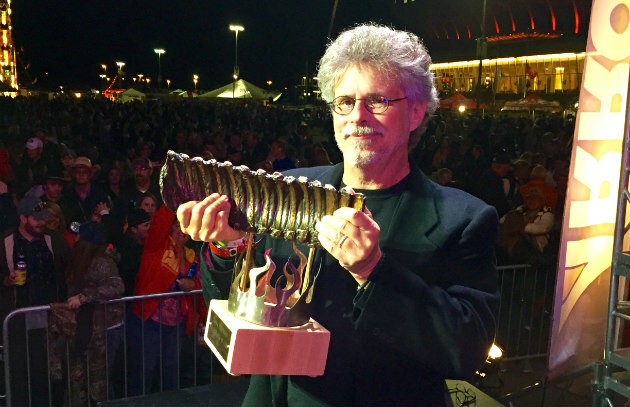 In October, I traveled to Kansas City to be inducted into the BBQ Hall of Fame! 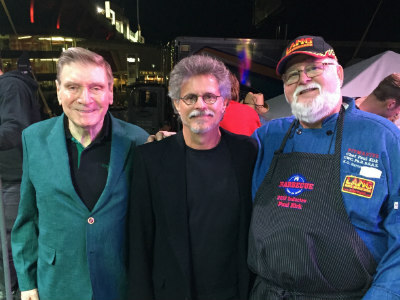 It was one of the proudest days of my career and I was certainly in good company: my co-inductees included Big Green Egg founder Ed Fisher and Kansas City Baron of Barbecue Paul Kirk. The trophy (a bronzed rack of baby backs) was as awesome as it looks. You can read my acceptance speech (complete with my predictions for the coming year) here. November: My annual Planet Barbecue research trip—this time to Europe and Morocco. In Spain we ate amazing jabugo ham (not smoked) and chuleton (grilled rib steak). 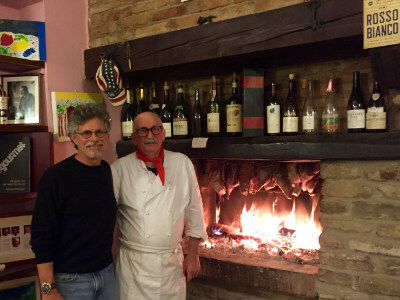 In Alba, Italy, we reconnected with our old friend Cesare Giacone, who spit-roasts baby goat in an oak burning fireplace. In Florence, we met two steak masters: Luciano Ghinassi, chef owner of Buca Lapi, and Montano of the Osteria del Caffe—both renowned for their bistecca alla fiorentina (Florentine steak). In Venice, we had no grilling, but we ate fabulous seafood at Alle Testiere. In Paris we found a terrific new barbecue joint (really) called The Beast. If you read French, look for my forthcoming story “Raichlen Mange Paris” (Raichlen Eats Paris) in the Journal de Montréal. Finally, in Fez, Morocco (an extraordinary medieval city) we feasted on cumin-scented köfta and charcoal-grilled chicken kebabs in the medina with our new friends Sandy McCutcheon and Suzanna Clark. Check out their website theviewfromfez.com and read Suzanna’s terrific book A House in Fez. December: Back home with family in Miami, and crazy busy reviewing the page proofs of Project Smoke. Once you turn in the manuscript, you may think you’re finished with a book, but actually the work is just beginning. It takes weeks to proofread each page and match up the photos with the text and recipes. The book launches on May 10, 2016, and I’ll be on a 25-city book tour in May through September. I’d love to meet you in your city, so please check out my event schedule. 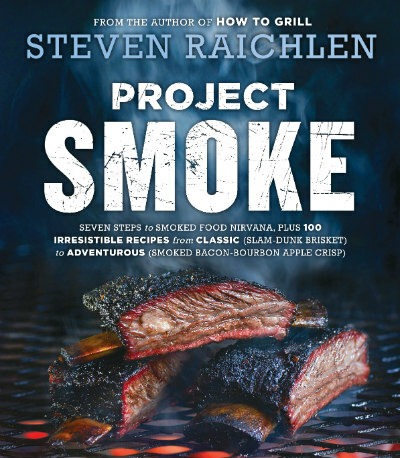 January 2016: OK, I know it’s still 2015, but next month Nancy, Rob, and I will be heading to Palm Springs, California, for the taping of Steven Raichlen’s Project Smoke 2016. Thirteen more sizzling, smoke- and fire-filled episodes featuring every imaginable grill and smoker. If there’s anything you’d like to see in the new series, let me know on the Barbecue Board. The whole crew at BarbecueBible.com and Project Smoke joins me in wishing you merry Christmas, happy holidays, and a New Year filled with health, happiness, love, and plenty of barbecue.